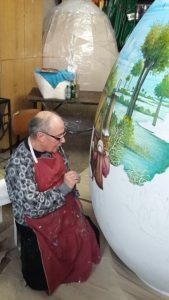 Naïve painters from Podravina started painting Easter Eggs from the Heart these days for Municipality Ivanska and City of Lendava in Slovenia. 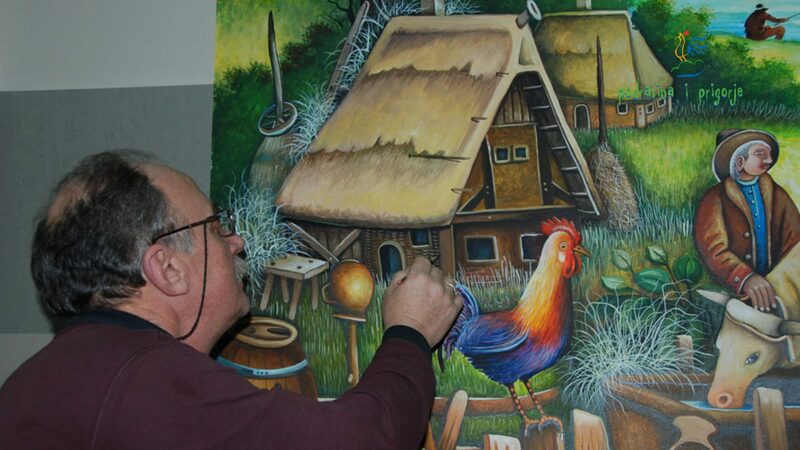 Painters Josip Gregurić, Đuro Jaković, Stjepan Pongrac and Zlatko Štrfiček are painting the Easter Egg for Ivanska in Koprivnica, and in Molve painters Martin and Stjepan Đukin, Vladimir Ivančan, Dragutin Kovačić and Drago Žufika are painting the Easter Egg for Lendava. The team in Molve was visited by the reporters of leading Chinese news agency Xinhua News Agency who made a report on Easter Egg from the Heart. The Director of the Tourist Board Mr. Zdravko Mihevc and the artists talked about a number of details related to the project Easter Egg from the Heart and Naïve. The reporter of the Chinese agency tried painting on Easter Eggs and expressed the wish that one day such Easter Egg dawns in China.